As we discussed earlier in When Do Corals Eat?, all corals require more than light in order to grow and reproduce. Most hobbyists who have corals in their saltwater aquariums pay close attention to the level of trace elements and calcium in their tank water. Keeping these levels as close to optimum as possible is an important part of a coral's overall health, but they do not provide any actual nutrition. Since one of the major goals of most aquarists is to keep their tanks as close to sterile as possible (with the exception of beneficial bacteria and trace elements) the average home aquarium provides scant nutrition to their resident corals. Adding extra food to your tank can be a double edged sword, however. If we try to keep the available food level in a closed aquarium system at the same level that is available to corals on the reef, it wouldn't take long for the average tank to crash due to the quantity of uneaten food decomposing in the tank's substrate. Many experienced aquarists have found that the judicious application of the proper mix of foods and additives to a coral tank is extremely beneficial to the corals. Active water circulation in the tank as well as a powerful protein skimmer will dispose of the uneaten food and avoid the accumulation of decaying matter. There are a number of commercially manufactured coral foods on the market (see Top Coral and Invertebrate Foods) which will fulfill a lot of the nutritious needs of many corals, but if you like to be in control of exactly what goes into your reef tank and is fed to your corals, the following may be of great interest to you. Follows is a coral food recipe which was inspired by Eric H. Borneman's "Homemade Coral Ration" which he published in "Aquarium Corals - Selection, Husbandry and Natural History". It is similar to what the oceans make available to reef corals in that it contains a wide variety of nutrients as well as elements and a variety of particle sizes, making it suitable for a mixed coral tank. 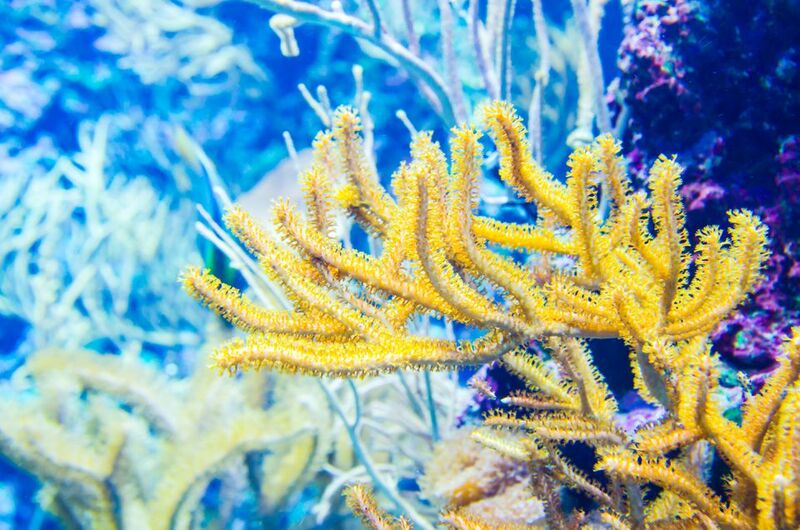 A key factor for coral foods is that it possess properties which allow the mix to remain suspended in the tank for long periods of time, rather than sinking quickly to the bottom of the tank. These seafoods contain blood or blood components, which are rich in nutrients. If one or more of these ingredients are not available, you may substitute similar items (raw, not precooked, canned or containing additional additives or other ingredients). The decapsulated (deshelled) Artemia are readily accepted my most corals as they do not have the shells, which many corals will reject. Frozen brine shrimp may be substituted, however, as with the Artemia, the shells may cause some corals to reject them. These ingredients are an excellent source of nutritional ingredients. 1/4 cup of red, green and brown seaweeds after soaking. Dried seaweeds can be found in pet shops and health food stores or in the Asian section of most food stores. Do not use roasted or other products which have flavors or other ingredients added to them. Seaweeds are an excellent food for zoanthids and other soft corals which feed on plant matter. Natural sea weeds are also an excellent source of iodine. Soak the seaweeds in fresh (dechlorinated) water until soft. Thaw all of the frozen ingredients in a bowl. Remove shells from all seafood. Crush all dry ingredients into a powder. A mortar and pestle is best, but various other kitchen implements (2 spoons, 1 spoon, and a small plate) can be used. Add liquid vitamins to the powdered ingredients. Liquefy all of the ingredients in a blender. Freeze in Ziplock bags in thin flats or in small compartment ice cube trays (cut pieces in half, or quarters for feeding convenience and store in Ziplock bags after freezing). Start by feeding small amounts (1/2 tsp per 50 gallons of system water per day) to begin with. You can gradually increase the amount, until you start to see water quality problems, then back off on the quantity a bit. The food can be administered at night (when most corals actively feed) or with the use of a turkey baster (dissolve the ration in a container of tank water and inject directly onto the corals). To keep the coral food suspended in the water column in your tank longer, turn off your protein skimmer for a couple of hours when feeding. This coral food is pure, high potency nutrition for your corals. Using a high-powered protein skimmer in your tank will greatly assist you in keeping the accumulation of uneaten food to a safe level.